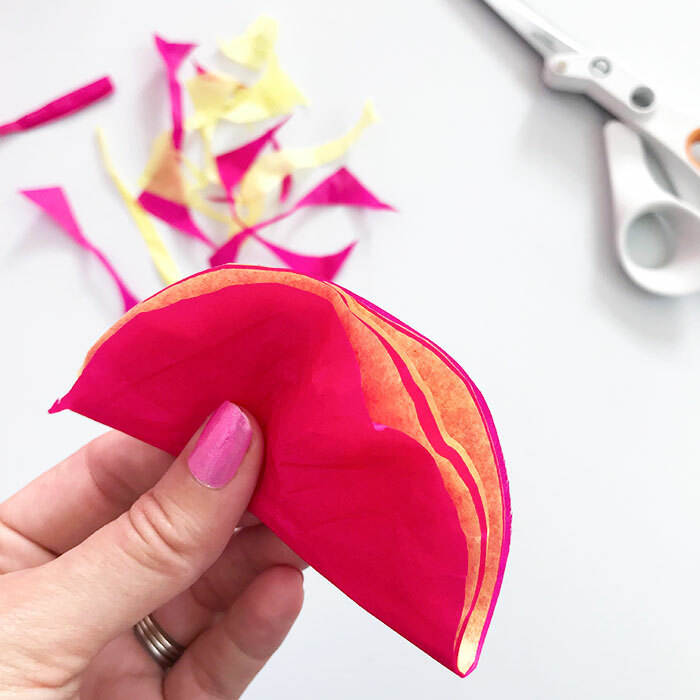 Jen Goode with 100 Directions is back again this month making easy tissue paper flowers that y’all are going to love! You can make your own easy tissue paper flowers for all kinds of occasions. 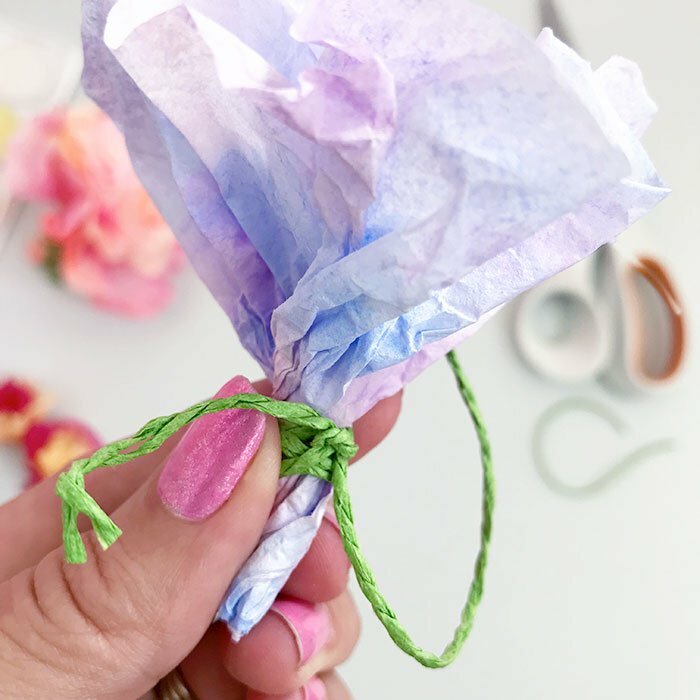 Tissue paper flowers are simple to make and you can customize them to make your favorite colors and decor. This is a basic flower design that you can use on a whole pile of projects. Accent a wreath, make a bouquet or design a pretty flower corsage. Once you know how to make this flower, you’ll be able to make all kinds of paper flower projects. 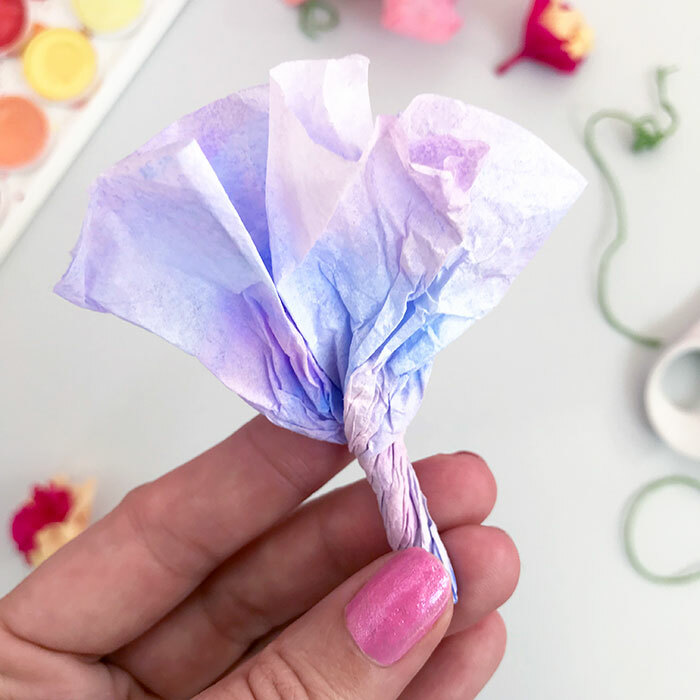 You can make tissue paper flowers in minutes with this simple technique. Use standard gift wrap tissue paper or colored coffee filters. I’ll show you how to make both. If you’re using coffee filters, add color and allow it to dry thoroughly. I used watercolor paint, applying layers of colors. To speed up the drying process, use a hairdryer. 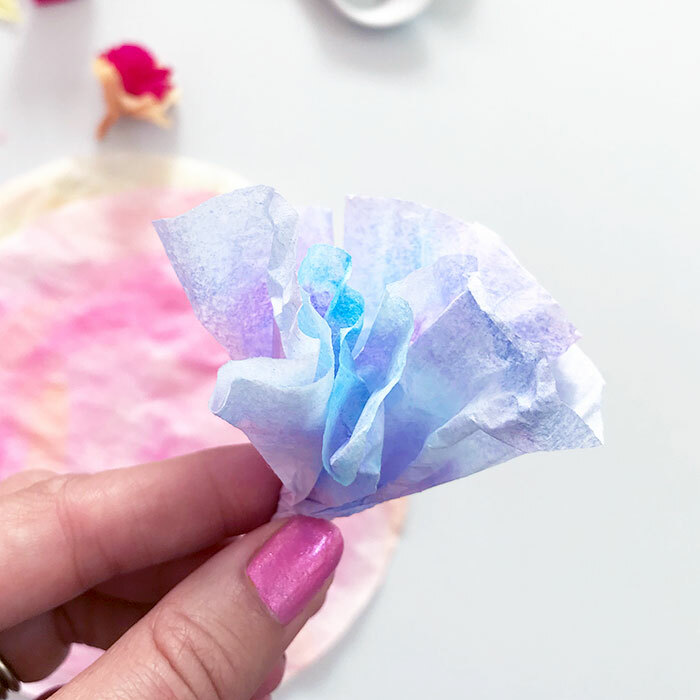 I have more details on my blog if you need help for creating your own painted coffee filters to make tissue paper flowers. 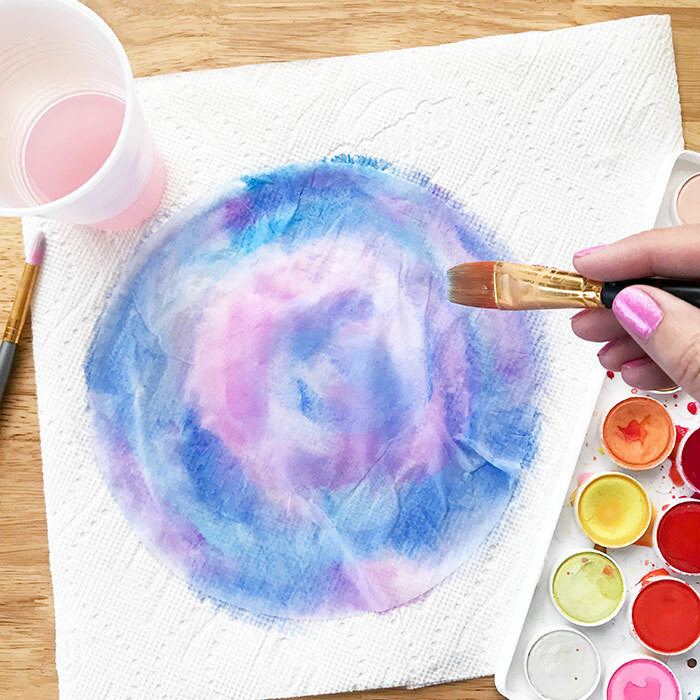 If you’re using tissue paper, cut layers of paper into circles. For this example, my circles are about 3 inches wide. Let’s start with a single layer flower. Create a cone shape by either placing your finger in the center of paper or folding paper starting in the center of the circle. Twist the center of the circle upward until you have a tight end to your flower. Wrap twine around this end and tie. Optionally, you can apply a little glue inside at the center of the flower to help hold it’s shape. 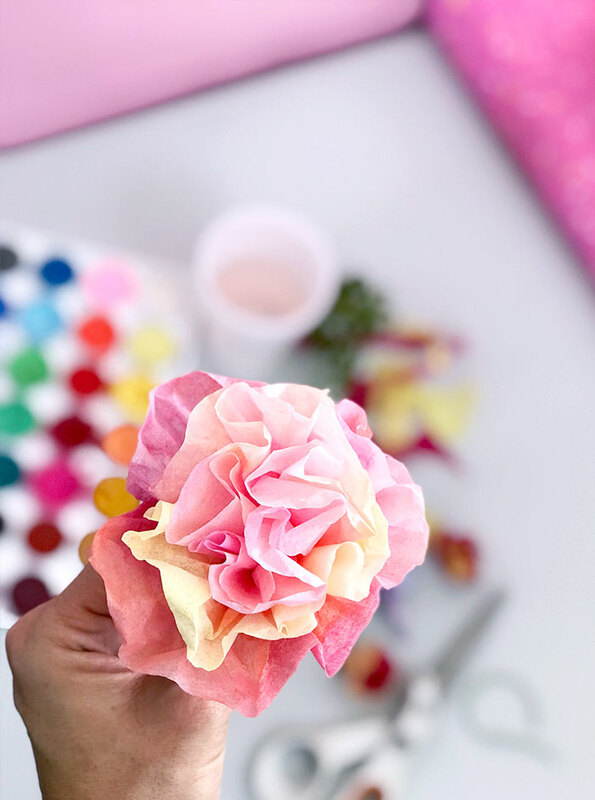 To make a layered tissue paper flowers, there are two options. Make a single layered flower, twisting the end. Add another paper layer and twist again. Layer 2-3 paper pieces and twist them all together. You can layer different colors of tissue paper or add additional color with paint or water-based markers. These flowers are such a pretty decor piece you can make for Mother’s Day, Easter, birthdays… or for a pretty every day accent added to your home. You can make them as fancy or as simple as you’d like. Add a little sparkle by dusting on a glitter accent or use a sparkly ribbon to tie up the flower twist. You can also add wire or chenille stems to create flower stems and create a full bouquet. 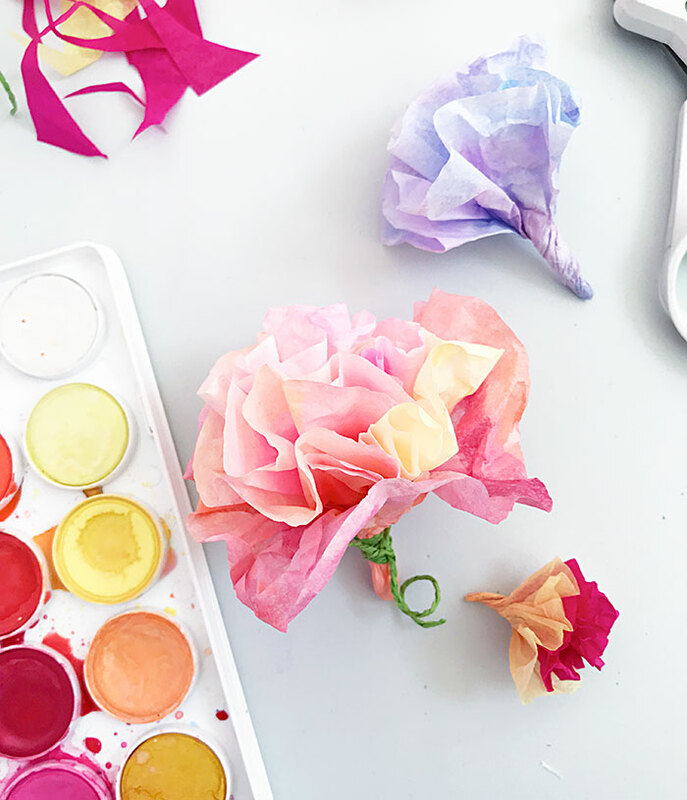 Get creative, I can’t wait to hear about all the tissue paper flowers you make! Love these and want more spring ideas? Try the links below! Very pretty! Great craft for kids too. Visiting from Talk of the Town. I remember making these in school, but haven’t seen any in years. What a great project. These look so pretty, and I just happen to have a box of coffee filters that don’t fit my new coffee maker. And with February being so gray, a quick colorful craft is just perfect. I love this – I remember making these as a kid! Congrats – you are one of our Featured Guests at Inspire Me Monday at Create With Joy!